Many people desire a fit and healthy body. It is easy to read through fitness magazines and websites and dream of a beach-ready figure. The demands of work and family often crowd out the hard part, finding time to actually exercise. It is even worse if you have a desk job where you tend to sit for hours on end and expend very little energy during the workday. Dr. James Levine from the Mayo Clinic was an early proponent of the treadmill desk as a way of increasing the opportunity for an otherwise sedentary worker to increase his or her exercise while updating TPS Reports. The first step is to get a treadmill. Craigslist is a great source for people looking to get rid of their treadmills now that they have found suitable clothes-hanging space elsewhere. I decided to purchase the Exerpeutic TF1000 Walk to Fitness Electric Treadmill . The Amazon product page includes a video which explains the machine’s features. 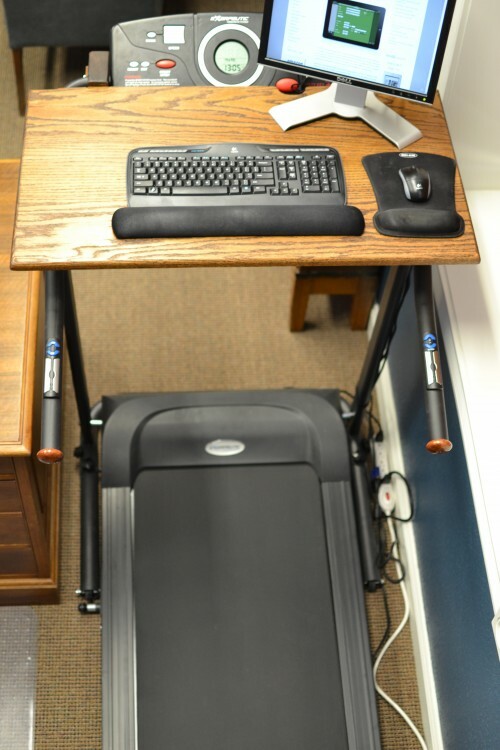 There are several important features that make this treadmill an ideal solution for a treadmill desk. 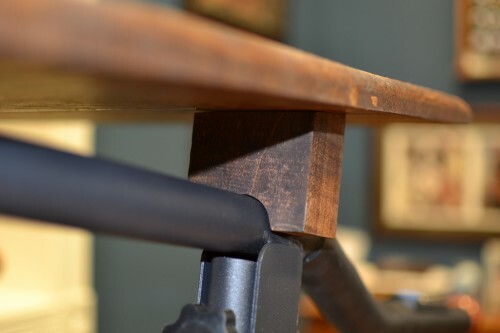 First, the layout lends itself very well to placing a desk atop the long, gently sloped arms without too much modification of the machine. Second, the treadmill is designed for slow walking and is adjustable in 0.1 mph increments up to 4.0 mph. Third, the on-board computer keeps the workout data in memory until you reset it, meaning if you walk for 20 minutes, turn it off, and then return later your time and distance is added to the previous 20 minutes so that at the end of the day you can see how far you traveled without having to write down the distance every time you step off the machine. The machine does stop after 99:59 minutes but you can simply press the start button again to continue your walk. The timer resets but the distance remains in memory. And finally, price. 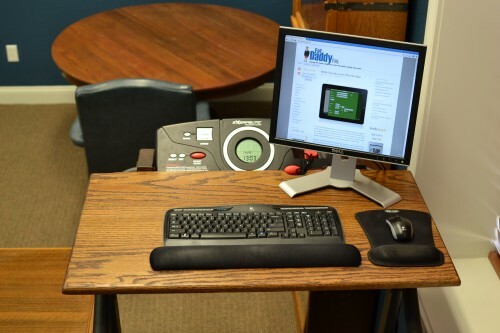 The treadmill and desk materials should not cost more than $500.00 which sounds like a lot but is quite a bit cheaper than some of the other available options such as the Details Walkstation which will set you back more than $4,000.00. Obviously you can save even more money if you already have a treadmill. To get video to the monitor on my treadmill desk, I used a Startech ST122LE 2-Port USB-Powered VGA Video Splitter to run a second VGA cable. I went ahead and purchased a Logitech Wireless Desktop MK320 Keyboard keyboard and mouse set so that I do not have to move anything to go from seated to walking. The monitor, keyboard and mouse are always setup and ready to go. 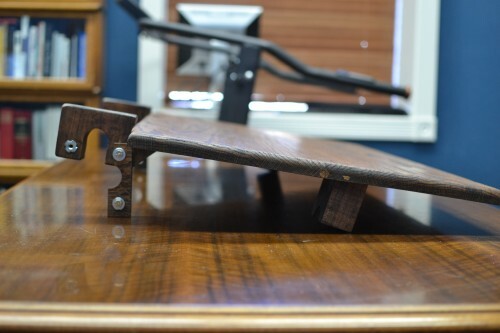 After setting up the treadmill, you need to create a flat surface for your desk. 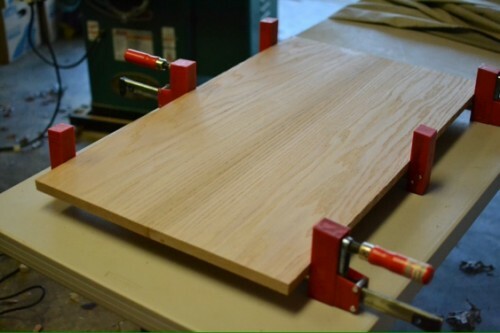 I glued two wide oak boards together to get a work surface 36″ wide x 20″ deep. If you do not have the necessary tools you can get a plywood panel cut to size at most hardware stores. 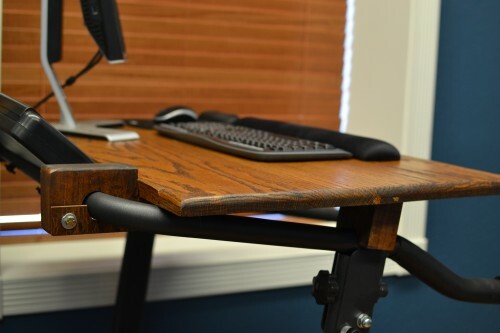 The desk needs to be secured to the treadmill so that you have a sturdy work surface. 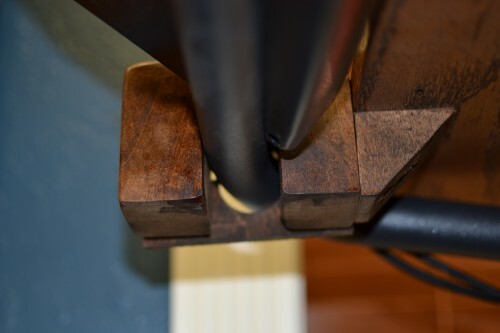 I created curved feet to connect the desk to the treadmill arms. After assembling the components, sanding the edges and staining the creation, it is ready to attach to the treadmill. To prevent the desk from tipping but keep it simple to remove I installed T-nuts and fashioned a piece of wood to fit around the treadmill piping. The smaller feet are angled at the top to ensure that the work surface is flat and sit freely on the treadmill arms for easy removal. 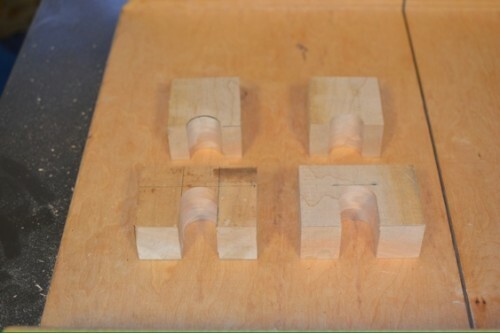 I also cut some triangle blocks to create more surface to glue and screw the large foot pieces to the end of the desk. With the monitor, keyboard and mouse in place you are ready to walk away the workday.